急性期脳虚血におけるsequential subtractionを用いた病態評価の検証, (大村知己，李鎔範，高橋規之，佐々木文昭，佐藤祐一郎，石田嵩人，豊嶋英仁), 日本CT技術学会第6回学術大会, 名古屋, 6/30, 2018. Performance evaluation of automated reconstruction method for planar image along orbitomeatal line on head CT images, (Yudai Kanazawa, Yongbum Lee, Akira Hasegawa, Noriyuki Takahashi, Naoya Takahashi), The 75th Annual Meeting of the Japanese Society of Radiological Technology, yokohama, 11-14 April, 2019. 4D-CTの位相比画像を用いた急性期脳梗塞の虚血評価, (大村知己, 李鎔範, 高橋規之, 豊嶋英仁), 第179回医用画像情報学会, 秋田市，10/7，2017. 4D-CTの位相比画像を用いた脳梗塞領域の決定, (大村知己, 李鎔範, 高橋規之, 豊嶋英仁), 第45回日本放射線技術学会秋季学術大会, 広島, 10/19-21, 2017. A novel perfusion map for assessment of brain ischemia in 4D-CT: Comparison with PET image, (T Ohmura, N Takahashi, Y Lee, M Kato, H Toyoshima, T Kinoshita), RSNA2017, Chicago, Nov 26-Dec 1, 2017. The Assessment of Contrast Media Circulation in Brain Ischemia with the Use of 4D CT Imaging, (T Ohmura, N Takahashi, Y Lee, H Toyoshima, T Kinoshita), RSNA2017, Chicago, Nov 26-Dec 1, 2017. 機械学習を用いた冠動脈CTにおける石灰化とSTENTの自動分類, (竹内悠, 長谷川晃, 李鎔範), 医用画像情報学会平成29年度秋季（第179回）大会, 秋田, 10/7, 2017. 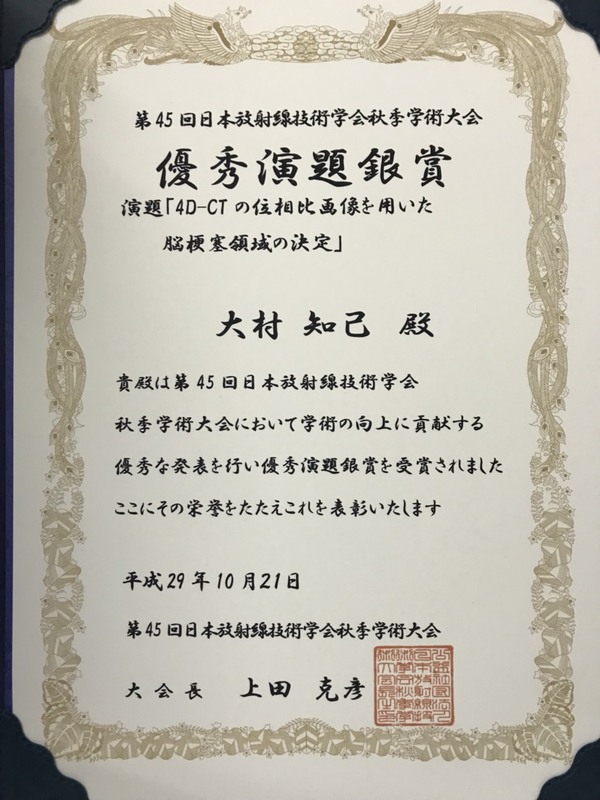 Low dose CT perfusion using hybrid iterative reconstruction algorithm, (Tomomi Ohmura, Yongbum Lee, Noriyuki Takahashi, Hideto Toyoshima, Toshibumi Kinoshita), Proc of International Forum on Medical Imaging in Asia (IFMIA), pp.114-116, Naha, Japan, January 19-20, 2017. 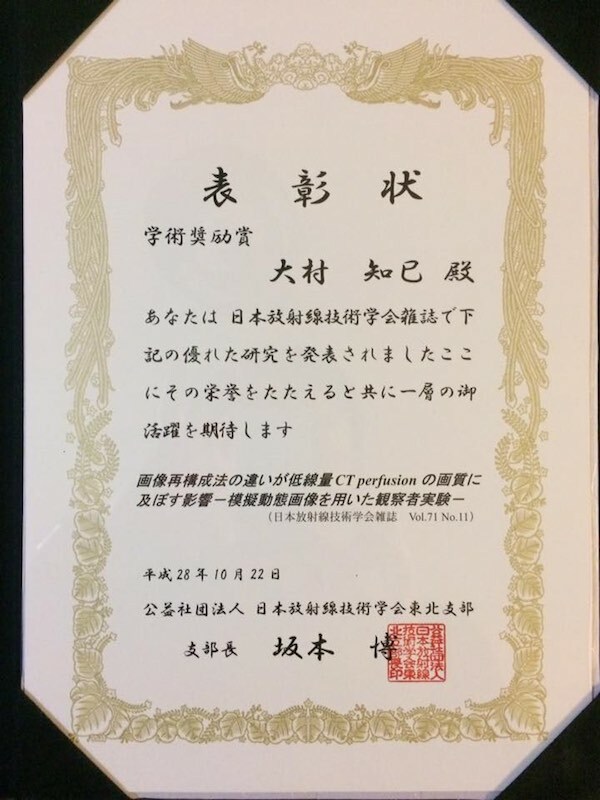 4D-CTの画質改善を目的とした時間軸加算平均処理の基礎的検討 −脳血管動態における加算平均時間の影響−, (大村知己, 李鎔範, 高橋規之, 佐藤祐一郎, 石田嵩人, 豊嶋英仁), Proceedings of the JSCT, vol.3, pp.1-5, 2015. 画像再構成法の違いが低線量CT perfusionの画質に及ぼす影響 −模擬動態画像を用いた観察者実験−, (大村知己, 李鎔範, 高橋規之, 佐藤祐一郎, 石田嵩人, 豊嶋英仁), 日本放射線技術学会雑誌, vol.71, no.11, pp.1063-1069, November 2015. Can iterative reconstruction contribute to low dose CT perfusion?, (Tomomi Ohmura, Yongbum Lee, Noriyuki Takahashi, et al)，European Congress of Radiology 2016，Vienna, 3/2~3/6, 2016. How to Obtain a Digital Perfusion Phantom to Evaluate the Effect of Iterative Reconstruction Methods on Noise Reduction in Brain CT Perfusion, (Tomomi Ohmura, Noriyuki Takahashi, Hideto Toyoshima, Yongbum Lee, Toshibumi Kinoshita), 100th Scientific Assembly and Annual Meeting of Radiological Society of North America (RSNA2014), Chicago, USA, November 30 - December 5, 2014.